How Yoda Helps Students Master Shakespeare :: Grammar, style, and proofreading quizzes use sentences from literature. The new Star Wars movie is a gift to English teachers. Easy Shakespeare is when Yoda-speak know you. Yoda’s speech patterns can help students overcome one of the biggest obstacles to understanding Shakespeare: the unfamiliar word order known as syntax inversion. Yoda, like Shakespeare, plays around with word order. You are strong, Luke. Strong you are, Luke. I go sadly into the mist. Into the mist sadly go I. The future is always in motion. Always in motion the future is. I can’t go there. Go there, I cannot. Much to learn you have. The castle of Macduff I will surprise. Agrees with you, the council does. Look I so pale, Dorset, as the rest? The shadow of greed, that is. Crowns in my purse I have . . . The boy you trained, gone he is. A gallant knight he was. Syntax inversion is a literary device that pre-dates Shakespeare. 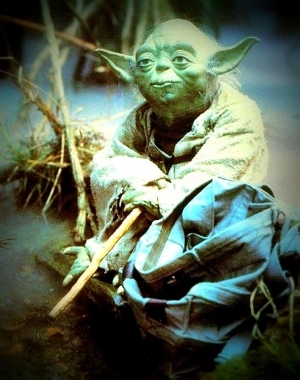 Translations of Homer’s Iliad use it: “Proud is the spirit of Zeus-fostered kings.” Inversion is common in the King James Version of the Bible: “Naked came I out of my mother’s womb, and naked shall I return thither.” The Star Wars screenwriters use syntax inversion to characterize Yoda as an ancient Jedi Master. Inversion also makes Yoda’s lines stand out from all the other characters’ lines, reinforcing his superior wisdom and status. Star Wars: Episode VII – The Force Awakens opens December 18, 2015. Coming soon on www.grammardog.com . . . a free downloadable syntax inversion quiz that uses Yoda-like lines from Shakespeare.